6 different grips that the child can use to practice fine motor skills. 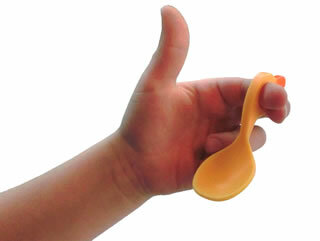 Five finger- , precision-, thumb- and transverse grip are a much more useful grip than the “whole hand grip” that a lot of childrens spoons invite to. 6 months: The child is eating with his hands. 9 months: The child begins to pick peas, crumbs, etc. 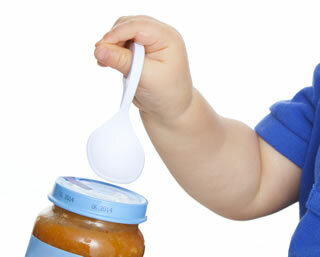 between the index finger and the thumb.Child holds spoon during feeding. Encourage child’s own eating. 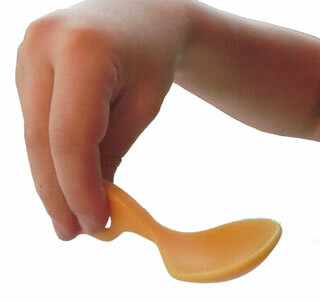 Use thumb or finger grips. 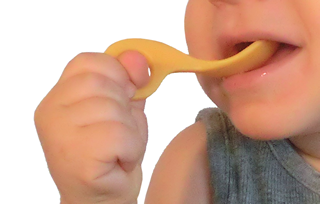 12 months: Children have develop their fine motor skills and can start to eat byt themselves with the twizer or precision grip.